I am uploading my new book onto the internet. Yes, I am. The book is not yet on the shelves, not yet touched by the mild boredom of commodification … OK, I’m copying again, from the introductory lines of Walter Benjamin’s famous essay “Unpacking My Library”, which media theorist Julian Dibbell riffed on in his dawn of the downloading age essay “Unpacking My Record Collection”. Those two excellent essays were concerned with the figure of the collector. But what concerns me here is, to use the title of another of Benjamin’s essays, “the author as producer”, and the act of donating a book, “my book”, to a library, if library is the right word for the place where my text is being deposited. 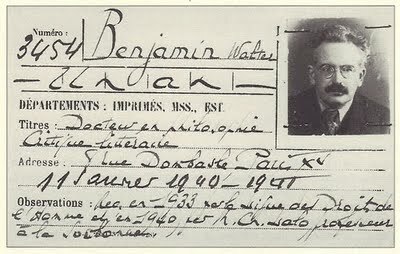 Walter Benjamin’s library card, Paris, 1940. While I was finishing In Praise of Copying, I became interested in the circulation of texts. I wondered whether it was hypocritical to write a book that celebrates copying, while still slapping a copyright notice to the front of the book. There are easy ways out of this: I could say that what I’m doing is presenting a critique of contemporary society but that obviously I have to work pragmatically within existing economic conditions, even though I disapprove of them. There’s some truth to that. In fact, the copyright notice to many academic books is in the name of the publisher, not the author. When I talked to people at Harvard, they pointed out to me that in signing a book contract, I had already signed away most of the rights to the book, and that it was therefore more honest for the publisher to claim and look after the copyright. I could have requested that I retain the copyright, as I did with my first HUP published book, but I thought there was something persuasive about their argument. And that I don’t need to own the copyright in order to feel some sense of agency in relation to what I’d written. “Given the topic and stance of In Praise of Copying, I wanted the text to participate openly in the circulation of copies that we see flourishing all around us. I approached Harvard to discuss options and they agreed to make the book available as a PDF online. The PDF is freely available to anyone who wants to download it, but it does come with a creative commons license that sets some intelligent restrictions on what you can do with it. Although generosity is a wonderful thing, this isn’t especially intended as a utopian gesture towards a world in which everything is free. It’s recognition of the way in which copies of texts circulate today, a circulation in which the physical object known as the book that is for sale in the marketplace has an important but hardly exclusive role. A PDF of a book is not an illegitimate copy of a legitimate original but participates in other kinds of circulation that have long flourished around the book-commodity: the library book; the photocopy or hand-written copy; the book browsed, borrowed or shared. We all know these modes of circulation exist, as they continue to do today with online text archives. I’ve been reading some of Douglas Rushkoff’s arguments for writers abandoning conventional publishing for a direct web based sales approach as well as the various arguments for and against eReaders, and Ted Striphas’ terrific book The Late Age of Print, which outlines some of the desperate strategies currently employed by authors and publishers. I understand the need for both authors and publishers to have a functioning economic model today. I’m a professor at a university and I don’t rely on income from books to make ends meet. The right to work and get paid is often invoked as a justification for existing intellectual property regimes. It’s a serious matter and I don’t have an easy solution to it. It’s not only authors and artists who are wondering how they’re going to get paid. Couldn’t you say that the car plant worker whose job is outsourced is also experiencing a crisis in the way that we relate to copies? In this case the industrial age copies that so much of our economy has been built around. I don’t think that economic arguments are the only important ones – there’s such a thing as a moral right, not just for authors, but for those who participate in the public domain, i.e. all of us. For example: in the last couple of years, the two most important independent booksellers in Toronto, Pages and This Ain’t the Rosedale Library have both gone out of business. While the chainstores are still there, the newly published “alternative” book as physical object has almost ceased to exist for those living in downtown Toronto. Such bookstores were more than places to make cash transactions for books, they were an important part of my education: as a former teenager/student/bohemian lowlife/grad student/freelance writer I browsed there, I read chapters, consulted indexes, wrote down citations. They were places were books were curated and presented in a powerful way I had more or less unimpeded access to the book as object. Probably if I’d tried to photograph pages from a book it wouldn’t have gone so well, but it never occurred to me to do that. And if I really needed to copy more, I would have searched the libraries and then copied a chapter while at work. Or actually bought the book, if I had the money. All of that activity has moved online. I don’t think we should rely on Googlebooks making texts available online. We should do it ourselves, or through our publishers. The pdf functions more or less the same way as the book sitting in the bookstore or the library, and I’m happy that my writing will be accessible to those who have a somewhat marginal relationship to book buying, as I myself have had at different points in my life. Making pdfs of all of our work available online is an easy but powerful gesture towards an expanded public domain. And it may even support the economic needs of writers and publishers: James Boyle believes so. So do I. There are proposals in the US for a National Digital Library, and perhaps one could dream of a Borgesian global Digital Library where every text ever written was to be found. Those proposals raise a number of interesting questions. But while the negotiation of legal protocols that would allow such a library to come into existence are daunting enough to make the project seem like a utopia, something like this library has already come into being, in a haphazard, piratical way on the internet. Which brings me to AAAAARG.ORG. AAAAARG feels like a secret because a lot of the texts that are listed on the site (but stored elsewhere) are arguably in breach of copyright law. But how secret is anything that has a URL? It’s already an open secret in the sense that scholars like Sedgwick and Taussig described it: something that everybody knows about but no one can talk about. And what is that something? The public domain itself as the primary fact of our society or any society. Many grad students, artists and professors I talk to have heard of AAAAARG and browsed it. It’s an amazing, but controversial resource, since the site is a library of theoretical texts that encompasses most of the work of most of the key thinkers of the last hundred years … except when their publishers have issued takedown notices to prevent copies of their texts appearing in the AAAAARG archive. There have also been attempts to shut AAAAARG down completely, including at least one this year. But the site floats up A.AAAARG turning into AAAAARG or some other iteration.